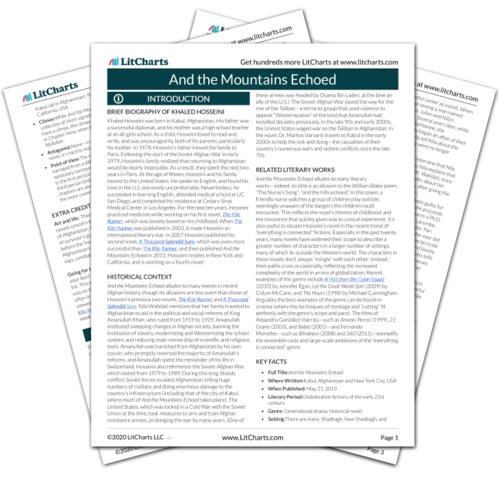 Instant downloads of all 946 LitChart PDFs (including And the Mountains Echoed). The narrator of Chapter Eight of And the Mountains Echoed, Dr. Markos Varvaris is a troubled plastic surgeon, who’s spent many years of his life trying to find a profession that will both bring him happiness and make his mother, Odelia, proud. As a young man, Markos develops a close friendship with Thalia—a friendship that ultimately inspires him to become a plastic surgeon and travel to Afghanistan, where he uses his training to care for the injured. Markos is also instrumental in reuniting Pari and Abdullah: after Nabi dies, Markos is the one to inform Pari that she has a brother. I said nothing even though he had it wrong. I was not joking that time. My staying was no longer for him. It had been at first. I had stayed initially because Suleiman needed me, because he was wholly dependent on me. I had run once before from someone who needed me, and the remorse I still feel I will take with me to the grave. I could not do it again. But slowly, imperceptibly, my reasons for staying changed. I cannot tell you when or how the change occurred, Mr. Markos, only that I was staying for me now. Suleiman said I should marry. But the fact is, I looked at my life and realized I already had what people sought in marriage. I had comfort, and companionship, and a home where I was always welcomed, loved, and needed. The physical urges I had as a man—and I still had them, of course, though less frequent and less pressing now that I was older—could still be managed, as I explained earlier. As for children, though I had always liked them I had never felt a tug of paternal impulse in myself. I am fifty-five years old. I have waited all my life to hear those words. Is it too late now for this? For us? Have we squandered too much for too long, Mamá and I? Part of me thinks it is better to go on as we have, to act as though we don’t know how ill suited we have been for each other. Less painful that way. Perhaps better than this belated offering. This fragile, trembling little glimpse of how it could have been between us. All it will beget is regret, I tell myself, and what good is regret? It brings back nothing. What we have lost is irretrievable. The timeline below shows where the character Dr. Markos Varvaris (“Mr. Markos”) appears in And the Mountains Echoed. The colored dots and icons indicate which themes are associated with that appearance. Arn, Jackson. "And the Mountains Echoed Characters: Dr. Markos Varvaris (“Mr. Markos”)." LitCharts. LitCharts LLC, 8 Jan 2016. Web. 25 Apr 2019. Arn, Jackson. "And the Mountains Echoed Characters: Dr. Markos Varvaris (“Mr. Markos”)." LitCharts LLC, January 8, 2016. 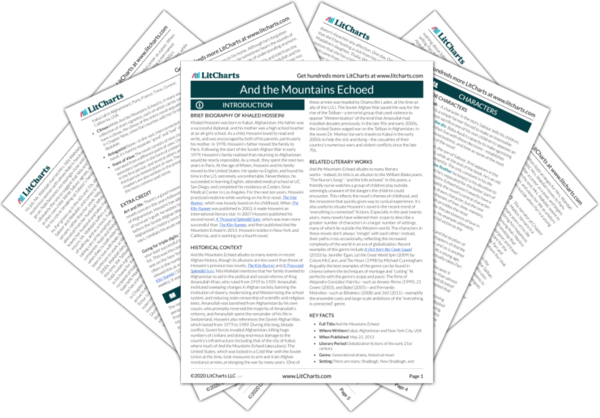 Retrieved April 25, 2019. https://www.litcharts.com/lit/and-the-mountains-echoed/characters/dr-markos-varvaris-mr-markos.